accumulation of phospholipids in tissues such as liver, kidney, brain and lung. in the lysosomes thereby become cationic in the acidic environment of lysosomes. of phospholipidosis is considered as an adverse reaction. sitoplazmaya, sitoplazmik vakuollere ve lamellar cisimciklerin oluşmasına neden olur. geçerler ve lizozomların asit ortamında katyonik hale geçip lizozomlarda tutulurlar. 1. Bagshaw RD, Mahuran DJ, Callahan JW: A proteomic analysis of lysosomal integral membrane proteins reveals the diverse composition of the organelle. Molecular & Cellular Proteomics. 2005, 4(2):133-143. 2. Walkley SU: Pathogenic cascades in lysosomal disease-why so complex? Journal of Inherited Metabolic Disease 2009, 32(2):181- 189. 3. Aits S, Jäättelä M: Lysosomal cell death at a glance. Journal of Cell Science 2013, 126:1905-1912. 4. Ohsumi Y: Molecular dissection of autophagy: two ubiquitin-like systems. Nature Reviews Molecular Cell Biology 2001, 2(3):211- 216. 5. Levine B: Eating oneself and uninvited guests: autophagy-related pathways in cellular defense. Cell 2005, 120(2):159-162. 6. Nonoyama T, Fukuda R: Drug-induced phospholipidosis-pathological aspects and its prediction. Journal of Toxicologic Pathology 21(1):9-24. 7. Halliwell WH: Cationic amphiphilic drug-induced phospholipidosis. Toxicologic Pathology 1997, 25(1):53-60. 8. Anderson N, Borlak J: Drug‐induced phospholipidosis. FEBS Letters 2006, 580(23):5533-5540. 9. van de Water F, Havinga J, Ravesloot W, Horbach G, Schoonen W: High content screening analysis of phospholipidosis: validation of a 96-well assay with CHO-K1 and HepG2 cells for the prediction of in vivo based phospholipidosis. Toxicology In Vitro 2011, 25(8):1870- 1882. 10. Reasor MJ, Kacew S: Drug-induced phospholipidosis: are there functional consequences? Experimental Biology and Medicine 2001, 226(9):825-830. 11. Sawada H, Takami K, Asahi S: A toxicogenomic approach to drug-induced phospholipidosis: analysis of its induction mechanism and establishment of a novel in vitro screening system. Toxicological Sciences 2005, 83(2):282-292. 12. Ikeda K, Hirayama M, Hirota Y, Asa E, Seki J, Tanaka Y: Drug-induced phospholipidosis is caused by blockade of mannose 6-phosphate receptor-mediated targeting of lysosomal enzymes. Biochemical and Biophysical Research Communications 2008, 377(1):268-274. 13. Nadanaciva S, Lu S, Gebhard DF, Jessen BA, Pennie WD, Will Y: A high content screening assay for identifying lysosomotropic compounds. Toxicology In Vitro 2011, 25(3):715-723. 14. Reasor MJ, Hastings KL, Ulrich RG: Drug-induced phospholipidosis: issues and future directions. Expert Opinion on Drug Safety 2006, 5(4):567-583. 15. Shayman JA, Abe A: Drug induced phospholipidosis: an acquired lysosomal storage disorder. B Biochimica et Biophysica Acta (BBA)-Molecular and Cell Biology of Lipids 2013, 1831(3):602- 611. 16. Cartwright ME, Petruska J, Arezzo J, Frank D, Litwak M, Morrissey RE, et al. : Phospholipidosis in neurons caused by posaconazole, without evidence for functional neurologic effects. Toxicologic Pathology 2009, 37(7):902-910. 17. Hirode M, Ono A, Miyagishima T, Nagao T, Ohno Y, Urushidani T: Gene expression profiling in rat liver treated with compounds inducing phospholipidosis. Toxicology and Applied Pharmacology 2008, 229(3):290-299. 18. Sadrich N, The regulatory challenge of drug-induced phospholipidosis. FDA Pharmaceutical Science and Clinical Pharmacology Advisory Committee meeting; Apr 14, 2010. 19. Hutchinson TH, Mahshid Y, Jönsson R, Björklund C, Kenne K: Proteomic analysis of phospholipidosis in citalopram treated U937 cells–support for the cholesterol biosynthesis hypothesis. Toxicology In Vitro 2008, 22(5):1198-1204. 20. Lüllmann‐Rauch R, Nässberger L: Citalopram‐induced generalized lipidosis in rats. Acta Pharmacologica et Toxicologica 1983, 52(3):161-167. 21. Wold JS, Joost RR, Griffing WJ, Marroquin F, Harris P: Phospholipid accumulation in rats produced by fluoxetine and chlorphentermine. Toxicology and Applied Pharmacology 1976, 37:118-119. 22. Gonzalez-Rothi RJ, Zander DS, Ros PR: Fluoxetine hydrochloride (Prozac)-induced pulmonary disease. CHEST Journal. 1995, 107(6):1763-1765. 23. Lüllmann-Rauch R, Reil G-H: Chlorphentermine-induced lipidosislike ultrastructural alterations in lungs and adrenal glands of several species. Toxicology and Applied Pharmacology 1974, 30(3): 408-421. 24. Gloster J, Heath D, Hasleton P, Harris P: Effect of chlorphentermine on the lipids of rat lungs. Thorax 1976, 31(5):558-564. 25. Lüllmann-Rauch R: Retinal lipidosis in albino rats treated with chlorphentermine and with tricyclic antidepressants. Acta Neuropathologica 1976, 35(1):55-67. 26. Lüllmann-Rauch R: Lipidosislike renal changes in rats treated with chlorphentermine or with tricyclic antidepressants. Virchows Archiv B Cell Pathology 1975, 18(1):51-60. 27. Kacew S: Alterations in newborn and adult rat lung morphology and phospholipid levels after chlorcyclizine or chlorphentermine treatment. Toxicology and Applied Pharmacology 1982, 65(1):100-108. 28. Kacew S: Gentamicin or chlorphentermine induction of phospholipidosis in the developing organism: role of tissue and species in manifestation of toxicity. Journal of Pharmacology and Experimental Therapeutics 1985, 232(1):239-243. 29. Reasor MJ, Koshut RA: Augmentation in antioxidant defense mechanisms in rat alveolar macrophages following induction of phospholipidosis with chlorphentermine. Toxicology and Applied Pharmacology 1980, 55(2): 334-341. 30. Reasor MJ, Walker ER: Recovery from chlorphentermine-induced phospholipidosis in rat alveolar macrophages: Morphological features. Experimental and Molecular Pathology 1981, 35(3):370-379. 31. Reasor MJ, Castranova V: Recovery from chlorphentermine-induced phospholipidosis in rat alveolar macrophages: Biochemical and cellular features. Experimental and Molecular Pathology 1981, 35(3):359-369. 32. Reasor MJ, Koshut RA, Castranova V: Biochemical characteristics of rat alveolar macrophages with chlorphentermine-induced phospholipidosis: Variations with increasing cell size. Experimental and Molecular Pathology 1979, 31(2):297-307. 33. Lüllmann-Rauch R: Lipidosis-like alterations in spinal cord and cerebellar cortex of rats treated with chlorphentermine or tricylic antidepressants. Acta Neuropathologica 1974, 29(3):237-249. 34. Frisch W, Lüllmann-Rauch R: Differential effects of chloroquine and of several other amphiphilic cationic drugs upon rat choroid plexus. Acta Neuropathologica 1979, 46(3):203-208. 35. Lüllmann-Rauch R, Reil G-H: Fenfluramine-induced ultrastructural alterations in tissues of rats and guinea pigs. Naunyn-Schmiedeberg's Archives of Pharmacology 1974, 285(2):175-184. 36. Ryrfeldt Å: Drug-induced inflammatory responses to the lung. Toxicology Letters 2000, 112-113:171-176. 37. Martin W, Kachel D, Vilen T, Natarajan V: Mechanism of phospholipidosis in amiodarone pulmonary toxicity. Journal of Pharmacology and Experimental Therapeutics 1989, 251(1): 272-278. 38. Reasor MJ, Ogle CL, Walker ER, Kacew S: Amiodarone-induced Phospholipidosis in Rat Alveolar Macrophages1-3. American Review of Respiratory Disease 1988, 137:510-518. 39. Riva E, Marchi S, Pesenti A, Bizzi A, Cini M, Veneroni E, et al. : Amiodarone induced phospholipidosis biochemical, morphological and functional changes in the lungs of rats chronically treated with amiodarone. Biochemical Pharmacology 1987, 36(19):3209-3214. 40. Heath M, Costa-Jussa F, Jacobs J, Jacobson W: The induction of pulmonary phospholipidosis and the inhibition of lysosomal phospholipases by amiodarone. British Journal of Experimental Pathology 1985, 66(4):391-397. 41. Mortuza GB, Neville WA, Delaney J, Waterfield CJ, Camilleri P: Characterisation of a potential biomarker of phospholipidosis from amiodarone-treated rats. Biochimica et Biochimica et Biophysica Acta (BBA)-Molecular and Cell Biology of Lipids. 2003, 1631(2):136-146. 42. Goldman I, Winkler M, Raper S, Barker M, Keung E, Goldberg H, et al. : Increased hepatic density and phospholipidosis due to amiodarone. American Journal of Roentgenology 1985, 144(3):541-546. 43. Delaney J, Neville WA, Swain A, Miles A, Leonard MS, Waterfield CJ: Phenylacetylglycine, a putative biomarker of phospholipidosis: its origins and relevance to phospholipid accumulation using amiodarone treated rats as a model. Biomarkers. 2004, 9(3):271-290. 44. Ágoston M, Örsi F, Fehér E, Hagymási K, Orosz Z, Blázovics A, et al. : Silymarin and vitamin E reduce amiodarone-induced lysosomal phospholipidosis in rats. Toxicology. 2003, 190(3):231-241. 45. D'Amico DJ, Kenyon KR, Ruskin JN: Amiodarone keratopathy: drug-induced lipid storage disease. Archives of Ophthalmology 1981, 99(2):257-261. 46. Adams P, Holt D, Storey G, Morley A, Callaghan J, Campbell R: Amiodarone and its desethyl metabolite: tissue distribution and morphologic changes during long-term therapy. Circulation 1985, 72(5):1064-1075. 47. Reasor MJ, McCloud CM, Beard TL, Ebert DC, Kacew S, Gardner MF, et al. : Comparative evaluation of amiodarone-induced phospholipidosis and drug accumulation in Fischer-344 and Sprague-Dawley rats. Toxicology 1996, 106(1-3):139-147. 48. Marchlinski FE, Gansler TS, Waxman HL, Josephson ME: Amiodarone pulmonary toxicity. Annals of Internal Medicine 1982; 97(6):839-845. 49. Kleiner DE. Amiodarone-Induced Phospholipidosis. In: Ferrell LD, Kakar S (eds) Liver pathology. Demos Medical Publishing; New York, USA. 2011: pp 237-239. 50. Guigui B, Perrot S, Berry JP, Fleury‐Feith J, Martin N, Métreau JM, et al. : Amiodarone‐induced hepatic phospholipidosis: A morphological alteration independent of pseudoalcoholic liver disease. Hepatology 1988, 8(5):1063-1068. 51. Martin W, Standing J: Amiodarone pulmonary toxicity: biochemical evidence for a cellular phospholipidosis in the bronchoalveolar lavage of human subjects. Journal of Pharmacology and Experimental Therapeutics 1988, 244(2):774-779. 52. Hauw J-J, Boutry J-M, Albouz S, Harpin M, Baudrimont M, Escourolle R, et al: Perhexiline maleate-induced lipidosis in cultured human fibroblasts: cell kinetics, ultrastructural and biochemical studies. Virchows Arch B Cell Pathology 1980, 34(1):239-249. 53. Yoshimura S, Hayashi Y: Ultrastructural alteratons of peripheral ganglia in rats by phospholipidosis-inducing drugs (The 5th Meeting for the Study of Toxic Effect). Journal of Toxicological Sciences 1978, 3(3):249-250. 54. Pessayre D, Bichara M, Feldmann M, Degott C, Potet F, Benhamou JP: Perhexiline maleate-induced cirrhosis. Gastroenterology 1979, 76(1):170-177. 55. Felix A, Feuer G, McGuire EJ, Takada A: Morphological and biochemical changes in the liver of various species in experimental phospholipidosis after diethylaminoethoxyhexestrol treatment. Toxicology and Applied Pharmacology 1975, 34(1):28-44. 56. Tashiro Y, Watanabe Y, Enomoto Y: Experimental phospholipidosis induced by 4, 4′‐diethyl‐aminoethoxyhexestrol. Pathology International 1983, 33(5): 929-942. 57. Yamamoto A, Adachi S, Ishikawa K, Yokomura T, Kitani T, Terushi N, et al. : Studies on drug-induced lipidosis. The Journal of Biochemistry 1971, 70(5):775-784. 58. Carlier M-B, Rollman B, Van Hoof Fi, Tulkens P: Mechanism of aminoglycoside-induced lysosomal phospholipidosis: in vitro and in vivo studies with gentamicin and amikacin. Biochemical Pharmacology 1982, 31(23):3861-3870. 59. Josepovitz C, Levine R, Farruggella T, Kaloyanides GJ: Comparative effects of aminoglycosides on renal cortical and urinary phospholipids in the rat. Experimental Biology and Medicine 1986, 182(1):1-5. 60. Kacew S: Cationic amphiphilic drug-induced renal cortical lysosomal phospholipidosis: an in vivo comparative study with gentamicin and chlorphentermine. Toxicology and Applied Pharmacology 1987, 91(3):469-476. 61. Giuliano RA, Paulus GJ, Verpooten GA, Pattyn VM, Pollet DE, Nouwen EJ, et al. : Recovery of cortical phospholipidosis and necrosis after acute gentamicin loading in rats. Kidney International 1984, 26(6):838-847. 62. Feldman S, Wang M, Kaloyanides G: Aminoglycosides induce a phospholipidosis in the renal cortex of the rat: an early manifestation of nephrotoxicity. Journal of Pharmacology and Experimental Therapeutics 1982, 220(3):514-520. 63. De Broe ME, Paulus GJ, Verpooten GA, Roels F, Buyssens N, Wedeen R, et al. : Early effects of gentamicin, tobramycin, and amikacin on the human kidney. Kidney International 1984, 25(4):643-652. 64. Van Bambeke F, Gerbaux C, Michot J-M, d'Yvoire MB, Montenez J-P, Tulkens PM: Lysosomal alterations induced in cultured rat fibroblasts by long-term exposure to low concentrations of azithromycin. Journal of Antimicrobial Chemotherapy 1998; 42(6):761-767. 65. Liu Y, Kam WR, Ding J, Sullivan DA: One man's poison is another man's meat: using azithromycin-induced phospholipidosis to promote ocular surface health. Toxicology 2014, 320:1-5. 66. Van Bambeke F, Montenez J-P, Piret J, Tulkens PM, Courtoy PJ, Mingeot-Leclercq M-P: Interaction of the macrolide azithromycin with phospholipids. I. Inhibition of lysosomal phospholipase A 1 activity. European Journal of Pharmacology 1996, 314(1-2):203-214. 67. Hopkins S: Clinical toleration and safety of azithromycin. The American Journal of Medicine 1991, 91(3):40-45. 68. Gray J, Purmalis A, Purmalis B, Mathews J: Ultrastructural studies of the hepatic changes brought about by clindamycin and erythromycin in animals. Toxicology and Applied Pharmacology 1971, 19(2):217- 233. 69. Cox JW, Ulrich RG, Larson PG, Cramer CT: Acute hepatocellular effects of erythromycin, gentamicin, and trospectomycin in the perfused rat liver: lack of correlation between lamellar body induction potency and cytotoxicity. Basic & Clinical Pharmacology & Toxicology 1988, 62(5):337-343. 70. Muñoz SJ, Martinez‐Hernandez A, Maddrey WC: Intrahepatic cholestasis and phospholipidosis associated with the use of trimethoprim‐ sulfamethoxazole. Hepatology 1990, 12(2):342-347. 71. Toubeau G, Nonclercq D, Zanen J, Lambricht P, Tulkens PM, Heuson- Stiennon J-A, et al. : Distribution of epidermal growth factor in the kidneys of rats exposed to amikacin. Kidney International 1991, 40(4):691-699. 72. Cox JW, Ulrich RG, Wynalda MA, Mckenna R, Larsen ER, Ginsberg LC, et al. : Reversible, hepatic, lysosomal phospholipidosis in rat induced by subchronic daily administration of trospectomycin sulfate. Biochemical Pharmacology 1989, 38(20):3535-3541. 73. Ulrich RG, Petrella DK, Larsen ER, Cox JW, Cramer CT, Piper RC, et al. : Hepatic changes produced by 30-day administration of a novel aminocyclitol antibiotic, trospectomycin sulfate, to laboratory animals. Fundamental and Applied Toxicology 1990, 14(1):60-70. 74. Hansson AL, Xia Z, Berglund MC, Bergstrand A, Depierre JW, Nässberger L: Reduced cell survival and morphological alterations induced by three tricyclic antidepressants in human peripheral monocytes and lymphocytes and in cell lines derived from these cell types. Toxicology In Vitro 1997, 11(1-2):21-31. 75. Lüllmann-Rauch R: Lipidosis-like ultrastructural alterations in rat lymph nodes after treatment with tricyclic antidepressants or neuroleptics. Naunyn-Schmiedeberg's Archives of Pharmacology 1974, 286(2):165-179. 76. Lüllmann-Rauch R: Lipidosis-like alterations in dorsal root ganglion cells of rats treated with tricyclic antidepressants. Naunyn-Schmiedeberg's Archives of Pharmacology. 1974, 283(2):219-222. 77. Lüllmann-Rauch R, Scheid D: Intraalveolar foam cells associated with lipidosis-like alterations in lung and liver of rats treated with tricyclic psychotropic drugs. Virchows Arch B Cell Pathology 1975, 19:255-268. 78. Palmeri S, Mangano L, Battisti C, Malandrini A, Federico A: Imipramine induced lipidosis and dexamethasone effect: morphological and biochemical study in normal and chronic GM2 gangliosidosis fibroblasts. Journal of The Neurological Sciences. 1992, 110(1-2):215-221. 79. Xia Z, Ying G, Hansson AL, Karlsson H, Xie Y, Bergstrand A, et al. : Antidepressant-induced lipidosis with special reference to tricyclic compounds. Progress in Neurobiology. 2000, 60(6):501-512. 80. Drew R, Siddik Z, Mimnaugh E, Gram T: Species and dose differences in the accumulation of imipramine by mammalian lungs. Drug Metabolism and Disposition 1981, 9(4):322-326. 81. Geist SH, Lüllmann-Rauch R: Experimentally induced lipidosis in uterine and vaginal epithelium of rats. Annals of Anatomy 1994, 176(1):3-9. 82. Bockhardt H, Lüllmann‐Rauch R: Zimelidine‐Induced Lipidosis in Rats. Basic & Clinical Pharmacology & Toxicology 1980, 47(1):45- 48. 83. Kodavanti UP, Lockard VG, Mehendale HM: In vivo toxicity and pulmonary effects of promazine and chlorpromazine in rats. Journal of Biochemical and Molecular Toxicology 1990, 5(4):245-251. 84. Glaumann H, Bronner U, Ericsson Ö, Gustafsson L, Rombo L: Pentamidine accumulates in rat liver lysosomes and inhibits phospholipid degradation. Pharmacology & Toxicology. 1994, 74(1):17-22. 85. Filippone E, Carson J, Beckford R, Jaffe B, Newman E, Awsare B, et al. : Sirolimus-induced pneumonitis complicated by pentamidine-induced phospholipidosis in a renal transplant recipient: a case report. Transplantation Proceedings 2011; 43(7):2792-2797. 86. Whitehouse L, Menzies A, Mueller R, Pontefract R: Ketoconazole- induced hepatic phospholipidosis in the mouse and its association with de-N-acetyl ketoconazole. Toxicology. 1994, 94(1-3):81-95. 87. Pakuts A, Parks R, Paul C, Bujaki S, Mueller R: Ketoconazole-induced hepatic lysosomal phospholipidosis: the effect of concurrent barbiturate treatment. Research Communications in Chemical Pathology and Pharmacology 1990, 67(1):55-62. 88. Lüllmann H, Lüllmann-Rauch R: Tamoxifen-induced generalized lipidosis in rats subchronically treated with high doses. Toxicology and Applied Pharmacology 1981, 61(1):138-146. 89. Huang L-K, Tsai M-J, Tsai H-C, Chao H-S, Lin F-C, Chang S-C: Statin- induced lung injury: diagnostic clue and outcome. Postgraduate Medical Journal 2013, 89:14-19. 90. Lantuejoul S, Brambilla E, Brambilla C, Devouassoux G: Statin- induced fibrotic nonspecific interstitial pneumonia. European Respiratory Journal 2002, 19(3):577-580. 91. Matsuzawa Y, Hostetler KY: Inhibition of lysosomal phospholipase A and phospholipase C by chloroquine and 4,4-bis(diethylaminoethoxy) α,β-diethyldiphenylethane. The Journal of Biological Chemistry 1980, 255:5190-5194. 92. Hallberg A, Naeser P, Andersson A: Effects of long‐term chloroquine exposure on the phospholipid metabolism in retina and pigment epithelium of the mouse. Acta Ophthalmologica. 1990, 68(2):125-130. 93. Gräbner R, Meerbach W: Imipramine and chloroquine induced alterations in phospholipid content of rat lung. Experimental Pathology 1983, 24(4):253-259. 94. Matsuzawa Y, Hostetler KY: Studies on drug-induced lipidosis: subcellular localization of phospholipid and cholesterol in the liver of rats treated with chloroquine or 4, 4'-bis (diethylaminoethoxy) alpha, beta-diethyldiphenylethane. Journal of Lipid Research 1980, 21(2):202-214. 95. Jones C, Salisbury RS, Jayson M: The presence of abnormal lysosomes in lymphocytes and neutrophils during chloroquine therapy: a quantitative ultrastructural study. Annals of The Rheumatic Diseases 1984, 43:710-715. 96. Mũller-Hõcker J, Schmid H, Weiss M, Dendorfer U, Braun G: Chloroquine- induced phospholipidosis of the kidney mimicking Fabry's disease: case report and review of the literature. Human Pathology 2003, 34(3):285-289. 97. Bonanomi MT, Dantas NC, Medeiros FA: Retinal nerve fibre layer thickness measurements in patients using chloroquine. Clinical & Experimental Ophthalmology 2006, 34(2):130-136. 98. Roos JM, Aubry M-C, Edwards WD: Chloroquine cardiotoxicity: clinicopathologic features in three patients and comparison with three patients with Fabry disease. Cardiovascular Pathology 2002, 11(5):277-283. 99. Brealey J, Carroll R: Hydroxychloroquine-induced phospholipidosis in a renal transplant patient. Ultrastructural Pathology 2017, 41(1):124-125. 100. Costa R: Hydroxychloroquine, Renal phospholipidosis: case report. Reactions 2013, 1470(1):24. 101. Khubchandani SR, Bichle LS: Hydroxychloroquine-induced Phospholipidosis in a Case of SLE: The Wolf in Zebra Clothing. Ultrastructural Pathology 2013, 37(2):146-150. 102. Heath M, Jacobson W: The inhibition of lysosomal phospholipase A from rabbit lung by ambroxol and its consequences for pulmonary surfactant. Lung 1985, 163(1):337-344. 103. Von Wichert P, Bavendamm U, Von Teichmann M, Müller G, Thalheim E, Wilke A, et al. : Increased incorporation of fatty acids into phospholipids of lungs and livers of rabbits under the influence of bromhexine and ambroxol. Naunyn-Schmiedeberg's Archives of Pharmacology 1977, 297(3):269-273. 104. Gil J, Thurnheer U: Morphometric evaluation of ultrastructural changes in type II alveolar cells of rat lung produced by bromhexine. Respiration 1971, 28(5):438-456. 105. Reasor M, Heyneman C, Walker E: Chlorcyclizine--induced pulmonary phospholipidosis in rats. Research Communications In Chemical Pathology and Pharmacology 1982; 38(2):235-246. 106. Ploemen J-PH, Kelder J, Hafmans T, van de Sandt H, van Burgsteden JA, Salemink PJ, et al. : Use of physicochemical calculation of pKa and CLogP to predict phospholipidosis-inducing potential: a case study with structurally related piperazines. Experimental and Toxicologic Pathology 2004, 55(5):347-355. 107. Pelletier DJ, Gehlhaar D, Tilloy-Ellul A, Johnson TO, Greene N: Evaluation of a published in silico model and construction of a novel Bayesian model for predicting phospholipidosis inducing potential. Journal of Chemical Information and Modeling 2007, 47(3):1196- 1205. 108. Hanumegowda UM, Wenke G, Regueiro-Ren A, Yordanova R, Corradi JP, Adams SP: Phospholipidosis as a function of basicity, lipophilicity, and volume of distribution of compounds. Chemical Research In Toxicology 2010, 23(4):749-755. 109. Choi SS, Kim JS, Valerio LG, Sadrieh N: In silico modeling to predict drug-induced phospholipidosis. Toxicology and Applied Pharmacology 2013, 269(2):195-204. 110. Kruhlak NL, Choi SS, Contrera JF, Weaver JL, Willard JM, Hastings KL, et al. : Development of a phospholipidosis database and predictive quantitative structure-activity relationship (QSAR) models. Toxicology Mechanisms and Methods 2008, 18(2-3):217-227. 111. Orogo AM, Choi SS, Minnier BL, Kruhlak NL: Construction and consensus performance of (q)sar models for predicting phospholipidosis using a dataset of 743 compounds. Molecular Informatics 2012, 31(10):725-739. 112. Liu N, Tengstrand EA, Chourb L, Hsieh FY: Di-22: 6-bis (monoacylglycerol) phosphate: a clinical biomarker of drug-induced phospholipidosis for drug development and safety assessment. Toxicology and Applied Pharmacology 2014, 279(3):467-476. 113. Chatman LA, Morton D, Johnson TO, Anway SD: A strategy for risk management of drug-induced phospholipidosis. Toxicologic Pathology 2009, 37(7):997-1005. 114. Park S, Choi YJ, Lee BH: In vitro validation of drug-induced phospholipidosis. The Journal of Toxicological Sciences 2012, 37(2):261-267. 115. Bauch C, Bevan S, Woodhouse H, Dilworth C, Walker P: Predicting in vivo phospholipidosis-inducing potential of drugs by a combined high content screening and in silico modelling approach. Toxicology In Vitro 2015, 29(3):621-630. 116. Frederick TE, Chebukati JN, Mair CE, Goff PC, Fanucci GE: Bis (monoacylglycero) phosphate forms stable small lamellar vesicle structures: insights into vesicular body formation in endosomes. Biophysical Journal 2009, 96(5):1847-1855. 117. Tengstrand EA, Miwa GT, Hsieh FY: Bis (monoacylglycerol) phosphate as a non-invasive biomarker to monitor the onset and time-course of phospholipidosis with drug-induced toxicities. Expert Opinion on Drug Metabolism & Toxicology 2010, 6(5):555-570. 118. Thompson KL, Haskins K, Rosenzweig BA, Stewart S, Zhang J, Peters D, et al. : Comparison of the diagnostic accuracy of di-22: 6-bis (monoacylglycerol) phosphate and other urinary phospholipids for drug-induced phospholipidosis or tissue injury in the rat. International Journal of Toxicology 2012, 31(1):14-24. 119. Thompson KL, Zhang J, Stewart S, Rosenzweig BA, Shea K, Mans D, et al. : Comparison of urinary and serum levels of di-22: 6-bis (monoacylglycerol) phosphate as noninvasive biomarkers of phospholipidosis in rats. Toxicology Letters 2012, 213(2):285-291. 120. Baronas ET, Lee J-W, Alden C, Hsieh FY: Biomarkers to monitor drug-induced phospholipidosis. Toxicology and Applied Pharmacology 2007, 218(1):72-78. 121. Abe A, Hiraoka M, Shayman JA: A role for lysosomal phospholipase A2 in drug induced phospholipidosis. Drug Metabolism Letters 2007, 1(1):49-53. 122. Ceccarelli M, Germani R, Massari S, Petit C, Nurisso A, Wolfender J-L, et al. : Phospholipidosis effect of drugs by adsorption into lipid monolayers. Colloids Surfaces B: Biointerfaces 2015, 136:175-184. 123. Yudate HT, Kai T, Aoki M, Minowa Y, Yamada T, Kimura T, et al. : Identification of a novel set of biomarkers for evaluating phospholipidosis- inducing potential of compounds using rat liver microarray data measured 24-h after single dose administration. Toxicology 2012, 295(1-3):1-7. 124. Sawada H, Taniguchi K, Takami K: Improved toxicogenomic screening for drug-induced phospholipidosis using a multiplexed quantitative gene expression ArrayPlate assay. Toxicology In Vitro 2006, 20(8): 1506-1513. ISNAD Boran, Tuğçe , Tarbin Jannuzzi, Ayşe , Alpertunga, Buket . "Drug Induced Phospholipidosis and Cationic Amphiphilic Drugs". 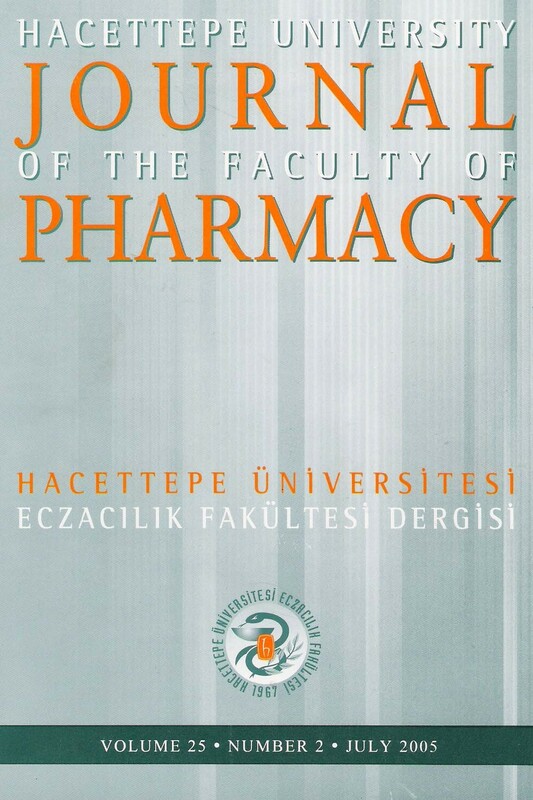 Hacettepe University Journal of the Faculty of Pharmacy 38 / 2 (June 2018): 65-75.